Present Owner: The Margaret Laurence Home Committee Inc.
Margaret Laurence, an internationally renowned author, was born and raised in Neepawa. After graduating in l947 from Winnipeg's United College, she worked as a reporter with the Winnipeg Citizen. Her years in Africa during the l950s inspired her first novel, This Side Jordan (l96l), which met with critical acclaim. Neepawa provided the setting for five later novels set in the fictional prairie town of Manawaka. Vivid prairie imagery and assertion of human dignity suffuse these works. Laurence received two Governor-General's awards for fiction and became a Companion of the Order of Canada in l97l. Laurence lived here in her grandfather's house from l935 to l944. Built ca. l894, the house, and her grandfather John Simpson, figured prominently in the Manawaka novels. 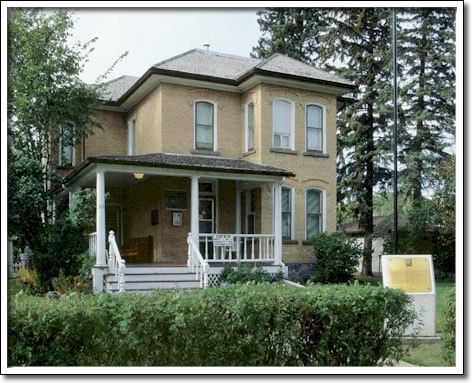 The house was purchased in l986 by the Margaret Laurence Home Committee and is dedicated to the literary career of "The First Lady of Manawaka."